For some time, the Gonbad-e Qabud in Maraghah in Western Iran has attracted considerable attention. Maraghah is a small city east of Daryacheh Urmiyeh in the East Azerbaijan province of Iran. It lies about 100 km south of Tabriz close to the southeastern shores of the huge super-salty lake at the southern foot hills of 3700 meters high Kuh-e Sahand. On the other side of the mountain lies the picturesque village of Kandovan, Iran’s Cappadocia . Maraghah is quite famous for its five tomb towers (four are preserved) from the Post-Seljuq and Mongolian periods (12th till early 14th centuries). 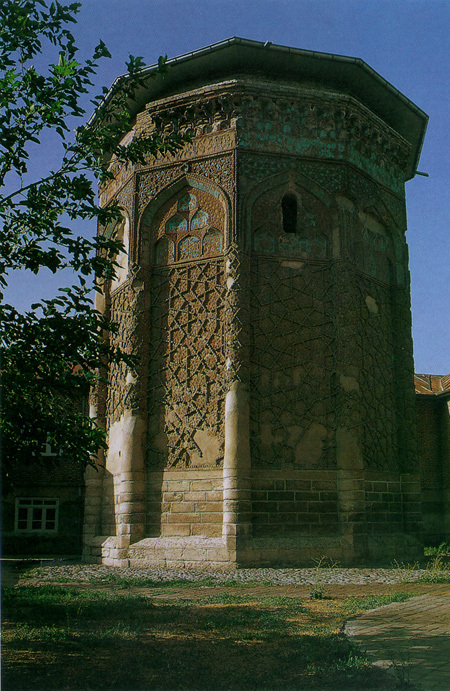 Gonbad-e Qabud, the Blue Tower (1196/97), has the most elaborated and complex brick pattern which has fascinated and confused generations of explorers and tourists. It represents an octagonal tower with eight panels each crowned by a niche with a pointed, gothic, arch. The brickwork results in highly ornamental net of unglazed ribs interlaced with turquoise blue ribbons unrelated to the pentagonal geometry of the overall pattern. It can be shown that the pattern extends over two panels and therefore repeats four times. “Aperiodic tiling with pentagonal geometry, discovered by Penrose [in 1974, 1978], have been, in its different versions, the object of intensive study by numerous mathematicians and crystallographers. The present discovery of a similar, 800-year-old tiling from (post) Saljuq Iran therefore represents a matter of considerable interest. Besides giving a surprising insight into the skills of ancient geometric artists, it also reveals some new aspects of Penrose tiling and leads toward further generalizations. “[Only] straight-line segments of the net intersect (at 72°), whereas all line breaks (of 108° or 144°) are outside these intersections. Polygons of the same kind do not share edges. Butterfly wings terminate in pentagons and are surrounded either by four additional pentagons or by an additional cis pair of pentagons and a cis pair of rhombs (each straddling the long diagonal). “The entire pattern is too complex to be understood at a glance. It requires long contemplation, and almost appears to be designed by a mathematician rather than an artist. Its badly damaged lowermost portions can be safely reconstructed because of the good state of preservation of the corresponding uppermost portions. As a matter of fact, the pattern on the Gonbad-e Qabud lacks any characteristics of a Penrose tiling. First and most eminently, it is not aperiodic. And secondly, it does not implement a self-similar subdivision. The small-scale pattern seen is unrelated to the large-scale major pattern . A simple method how the medieval artists (and it can be argued that in that particular case not even a mathematician was involved in the process of decoration) has been suggested by Lu and Steinhardt . They discovered, on what is called now the Topkapı Scroll , a 15th century Timurid-Turkmen scroll now in the collection of the Topkapı Palace Museum in Istanbul, that most of the highly complex geometric patterns found on buildings and paintings in the Islamic world can be created seamlessly with the aid of a set of five tiles displaying well-defined decorative ribbons, a decagon, a pentagon, an elongated hexagon, a bowtie, and a rhombus, which they called girih tiles which “[share] several geometric features: every edge of each polygon has the same length and the two decorating lines intersect the midpoint of every edge at 72° and 108° angles. This ensures that when the edges of two tiles are aligned in a tessellation, decorating lines will continue across the common boundary without changing direction. 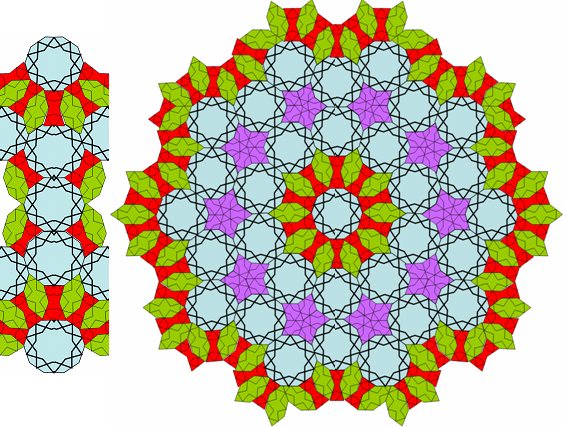 Because both line intersections and tiles only contain angles that are multiples of 36°, all line segments in the final girih strapwork pattern formed by girih-tile decorating lines will be parallel to the sides of the regular pentagon; decagonal geometry is thus enforced in the girih pattern formed by the tessellation of any combination of girih tiles. 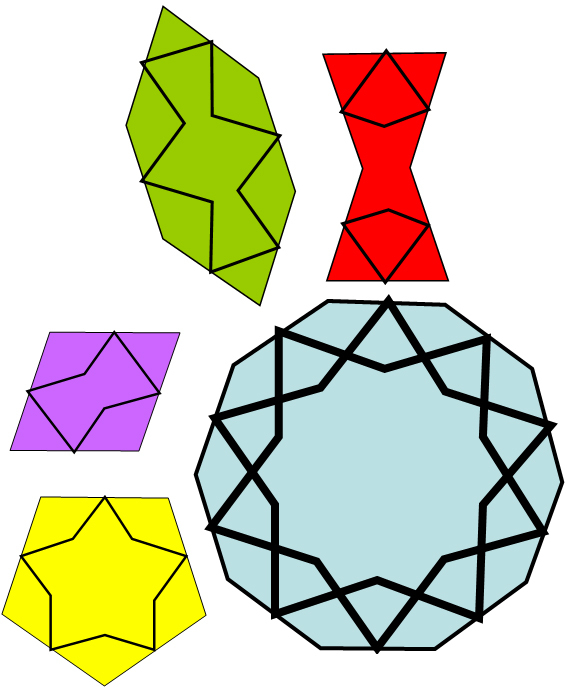 The tile decorations have different internal rotational symmetries: the decagon, 10-fold symmetry; the pentagon, five-fold; and the hexagon, bowtie, and rhombus, two-fold” . Lu and Steinhardt reconstructed the pattern on the Gonbad-e Qabud with four girih tiles. I have followed the suggestion by Makovicky and have not included a decagon “rosette”. Another suspected site displaying allegedly a “quasi-crystalline” pattern of tesserae is the western iwan of Masjed-e Jomeh in Esfahan. The reconstruction revealed that it is not a Penrose tiling. The “dazzling” appearance turns out to be largely a rosette which can be constructed by use of a set of four girih tiles. There is no self-similar subdivision. In a way, it resembles a bit the pattern found in Maraghah, although there, some irregularities occur, as described above. The artists who have created the decorations at either site (1197 in Maraghah, mid of the 15th century in Esfahan) did not use color but chose a high degree of abstraction. It is amazing that an intentional reduction of a piece of art to a strict geometric pattern with an unbelievable degree of precision has led to profound confusion among a large number of visitors. The perception of the artistic effort in fact confused even certain scientists who argued that medieval artists could have discovered what became famous as Penrose patterns, 500 or even 800 years before they were described and understood in the West. I have posted some pictures about trips in and around Tabriz on Salmiya. 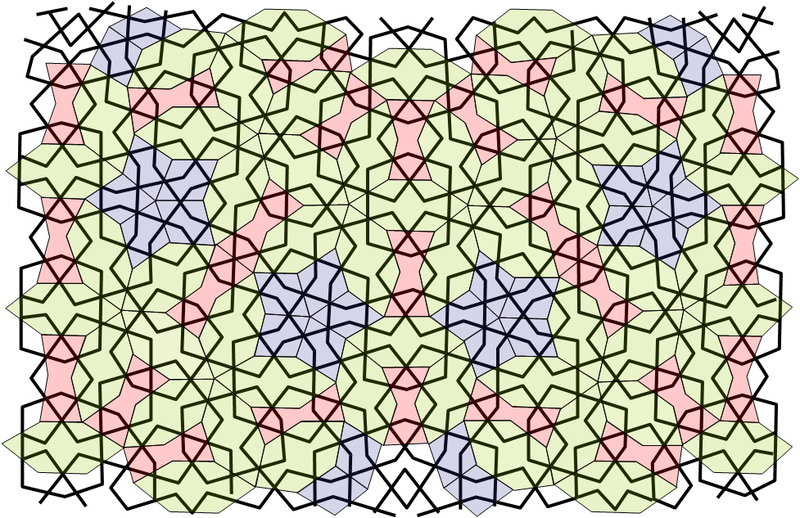 Makovicky E. 800-year-old pentagonal tiling from Marāgha, Iran, and the new varieties of aperiodic tiling it inspired. In: Istvan Hargittai (ed.) Fivefold Symmetry. World Scientific, Singapore 1992, pp. 67-86. See Lu and Steinhardt’s response to Makovicky’s comment on their paper at Science 2007; 318: 1383b. Lu PJ, Steinhardt PJ. 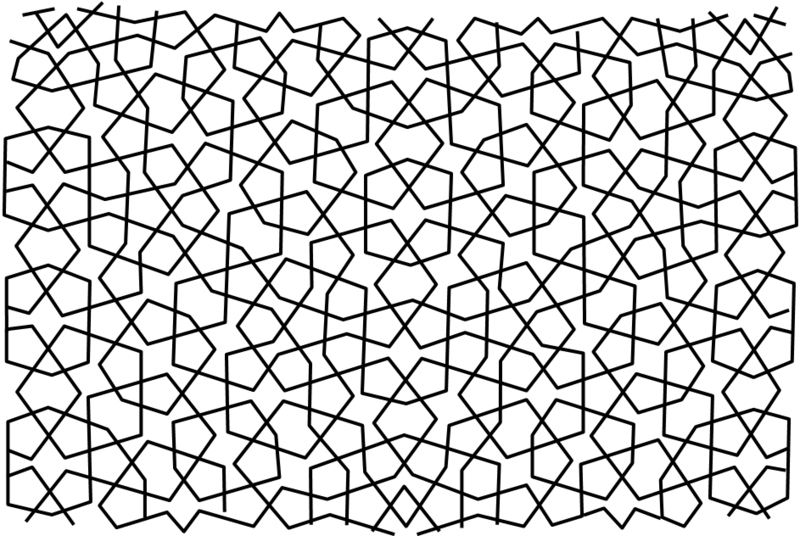 Decagonal and quasi-crystalline tilings in medieval Islamic architecture. Science 2007; 315: 1106-1110. Necipoglu G. The Topkapı Scroll: Geometry and Ornament in Islamic Architecture. Getty Center for the History of the Art and Humanities. Santa Monica, CA, 1995. This entry was posted in Art, Iran, Islam, Science and tagged Emil Makovicky, Esfahan, girih tiles, Gonbad-e Qabud, Maraghah, Masjed-e Jomeh, Paul J. Steinhardt, Penrose tiling, Peter J. Lu. Bookmark the permalink.